The options on this tab are used when automatically setting up sectors on a run. You can set the length of all automatically added track markers. The analysis software can analyse the run and try to divide it up by corners. In this case the number of sectors that are defined depends on they layout of the run. The system used the corner radius set above and searches for corners that meet this minimum radius. ONce all the corners have been found then a marker is placed between each corner i.e. in the middle of the "straights" between corners. 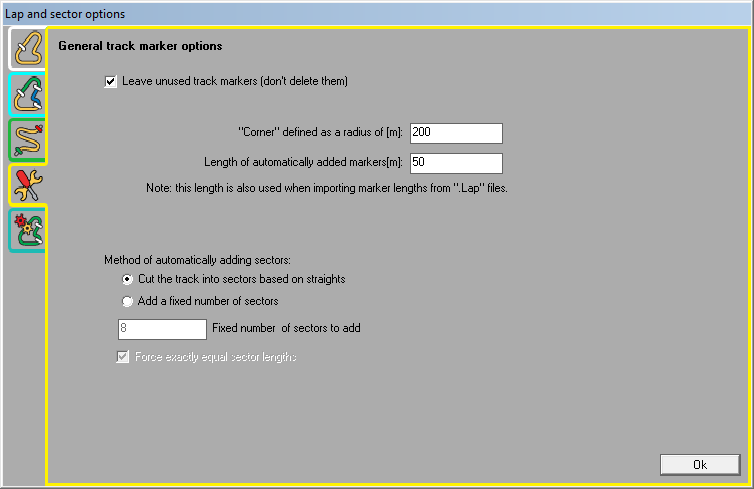 Alternatively, the software can simply divide the run into a fixed number of sectors (between 2 and 99). In this case the distance for the fastest complete lap (or open run) is checked, and then the required number of track markers added. There is a further option when placing a fixed number of markers "force exactly equal sector lengths". If this option is set then no more processing is done by the analysis software and each sector added will be exactly the same length. For example if the lap length was 1km and 10 sectors where added, each sector will be exactly 100m. If this option is unchecked, then the analysis software will add the required number of sectors, but then "move" the track markers to try and avoid having a track marker near the apex of a corner - which is typically not very helpful when looking at data.